I told you so. Or I told anyone who cared. I even tried to reach the Obama administration in four or five different ways. Do a search on Yahoo right now for miserable failure, and you’ll find President Barack Obama’s page ranking either in the top spot or the second spot. Given a redirect that Obama’s web team has put into place, he should solidify into that number one spot over time. Eventually, Microsoft’s Live Search should reflect that, as well. And over at Google, Obama will likely gain a top page listing for a search on failure. I know. There are bigger issues Obama has to deal with. But then again, this is supposed to be the tech-savvy presidency. It should be search engine optimization savvy, as well. What happened? If you want the long version, see my Bush: Fix Your “Miserable Failure” Googlebomb Legacy Before Obama Takes Office article from earlier this month. It documents how people “Googlebombed” George W. Bush’s biography to rank tops for searches on “miserable failure” at Google and other search engines. Bush’s web team tried to kill that bomb by redirecting any request for Bush’s biography to a page for all US presidents. I had a slight hope that when the new White House site went up, the bomb might permanently be defused because of how the site was failing to redirect requests for many pages properly (for more on the new White House site’s issues with redirection, see my follow-up article, Despite Inauguration, Google & Others Still Think It’s President Bush, Not President Obama plus Vanessa Fox’s article Making Site Architecture Search-Friendly: Lessons From whitehouse.gov). For the real tech nerds out there, the redirect is a 301 “permanent” one, which means the White House is explicitly telling search engines that the old Bush biography has now been permanently replaced by Barack Obama’s page. As a result, Obama now inherits all the links containing anchor text with the words “miserable failure” in them. IE, all those links are acting as votes saying that Obama should rank well for those words. Ugh. Over at Google, almost exactly two years ago, they put in a fix to solve the Googlebombing issue. That dropped Bush out of the top results for those two words (and thus is still keeping Obama out), but then he came back up for the single word failure. That seemed down to Bush’s brief use of the word “failure” on the page (George W. Bush: A Failure Once Again, According To Google explains this more), and once the word was no longer used, it stopped ranking for it — at least until recently. Notice how Google is still reporting that the page is about Bush, listed in position three. That’s because it has yet to process the redirect. Because that page redirects to Obama’s page, as with Yahoo, it’s going to inherit all the failure love. I’m glad the White House has put redirects in place. As I pointed out, the lack of them meant many people trying to find biographies of past presidents such as George Washington were going to get errors. And it’s understandable that it would take them some time to get them in place. My assumption is that on Inauguration Day, the old site was completely removed and the new prebuilt site was installed, with the redirects being something they figured they’d quickly process in the coming days. (Plus, consider the technological “dark ages” they’re found after moving into the White House). That will fix the bomb. More important, that’s where Bush’s biography is actually located. There are people who linked to the old address for his biography for non-political reasons. They should be redirected to the correct location. The good news is that doing this shouldn’t cause the page for all US presidents to suffer the past Googlebomb. In addition, anyone who bookmarked Bush’s biography under this generic URL can still find it as part of a list of all US presidents. In other news, I’d earlier covered how the White House wasn’t using the NOODP tag, which meant that Google was listing the White House home page in some cases as if Bush was still in office. 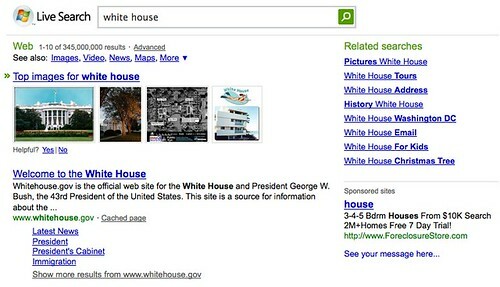 The White House still hasn’t made use of that tag, but after Google noticed the issue, they fixed it on their end. After two days, I’d have expected Microsoft to have recrawled the home page and reflect an updated listing by now. I’m pretty sure it won’t be much longer until that’s fixed. Postscript 3 (Jan. 23, 8:30am Pacific): Microsoft is now showing an updated description for the White House home page that reflects Obama being in office. Postscript 4 (Jan. 23, 2:30pm Pacific): Related coverage is begining. See Techmeme, the Wall Street Journal, MediaPost, UPI, the Los Angeles Times and the New York Times. Postscript 5 (Jan. 23, 3:50pm Pacific): Obama no longer ranks for “failure” on Google. The White House hasn’t changed anything. The link data that Google has been using to rank the Bush page — data inherited by Obama’s page — hasn’t changed. So the Googlebomb fix for this that hasn’t worked since earlier this month just happens to kick in a few hours after I post this article? That’s going to kick off another round of questioning over how “automated” that fix really is, as happened when Stephen Colbert briefly ranked for greatest living american. We do two different things — both of them algorithmic — to handle Googlebombs: detect Googlebombs and then mitigate their impact. The second algorithm (mitigating the impact of Googlebombs) is always running in our productionized systems. The first algorithm (detecting Googlebombs) has to process our entire web index, so in most typical cases we tend not to run that algorithm every single time we crawl new web data. I think that during 2008 we re-ran the Googlebomb detection algorithm 5-6 times, for example…. Reasonable enough, and Google’s said similar things before when new Googlebombs have emerged, then disappeared after attention. What happened there is we re-ran our algorithm in December 2008, and at that time the detection algorithm didn’t flag [failure] as a Googlebomb. We don’t claim that our detection algorithm is 100% perfect; for example, that can happen because the link structure of the web does change over time, as does how we crawl the web. Over at Microsoft, neither the old Bush page nor the new Obama page are now ranking for miserable failure. The Bush page had been ranking for that. Why this no longer happens is unclear. Postscript 7 (Jan. 30, 2pm): Just noticed that the White House now has implemented redirects as I suggested above. That means I’d expect to see the Obama bio drop for searches on “miserable failure” at Yahoo and Microsoft, where it currently shows (yes, it started again at Microsoft). When? I’d guess between a week and a month. Postscript 8 (Feb 12, 11pm): Yahoo now shows Bush’s biography as number one for miserable failure, in place of where Obama was showing. At Microsoft, once again, neither the Bush or Obama pages are now ranking at all.